But as it turns out, the RTL-SDR project wasn’t the first time software and hardware serendipitously combined to allow hackers to pull back the curtain on the world of radio. All the way back in 1975, an article written by Steve Dompier was published in the People’s Computer Company Newsletter and republished in Dr. Dobb’s Journal of Computer Calisthenics & Orthodontia in 1976 that described a very curious discovery. 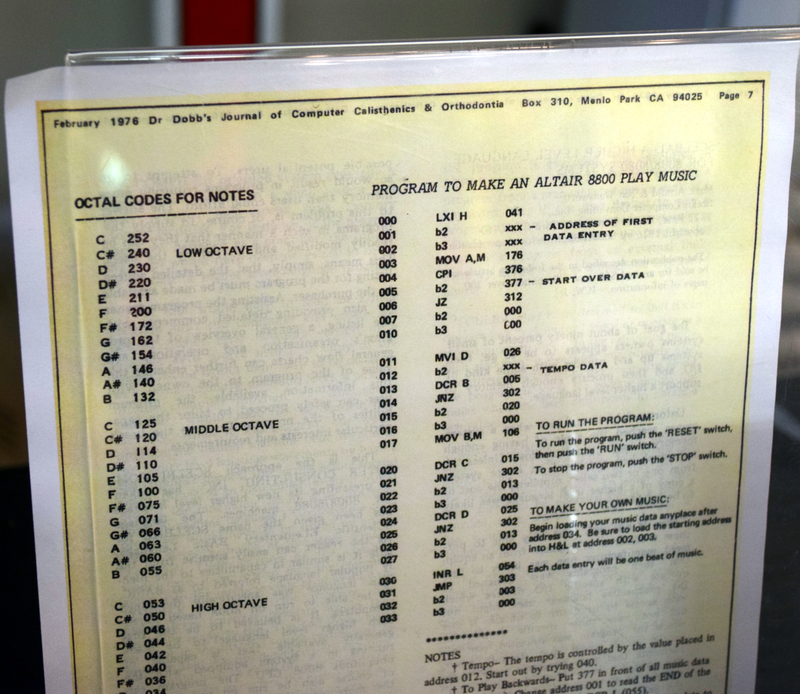 Nearly a decade before a team at Raytheon would coin the term “software radio”, the article showed that with just a few lines of code one could generate AM radio transmissions from their MITS Altair 8800. At the time, this was a huge deal. Some even argue that it made an AM radio one of the first I/O devices for use with the Altair 8800. At demonstration of the code at a meeting of the Homebrew Computer Club reportedly ended in a round of wild applause, and Bill Gates would later describe it as one of “The best demo programs I’ve seen for the Altair.” A particularly strong endorsement, considering at this point Gates would have been pushing Microsoft’s BASIC language for the Altair, which this technique didn’t use. At the recent Vintage Computer Festival East, Bill Degnan showed off an evolved version of Dompier’s original concept that he calls “Altair Jukebox” (on this page you can also find a PDF version of Steve Dompier’s 1975 article). Even 43 years after the discovery that the Altair could perform such a feat, it delighted everyone who stopped by the table. With the LEDs flickering away as the songs came strong and clear through the nearby vintage AM radio, the whole thing seemed almost magical. It’s no wonder Bill Gates was impressed. Naturally, more than a few people wanted to know exactly how the music was being generated. For awhile Bill even had the top off of the Altair so you could see inside; akin to the magician pulling up his sleeves so you can see he wasn’t hiding anything. No, there was no little AM radio transmitter hidden inside the Altair, the effect is simply the product of carefully generated electromagnetic interference (EMI). In truth, it’s due more to a design flaw in the Altair than anything else. Inadequate EMI shielding in the computer allows a nearby radio to pickup the switching noise of the electronics, causing considerable interference in the low AM frequencies when it’s in operation. Similar effects have been observed with other computers of the era, such as the PDP-8. You can pickup the interference regardless of what program is running on the Altair, it’s just that most programs will generate unstructured noise. But with skillful manipulation of this effect, it’s possible to create something that’s actually quite pleasant sounding. As it so happens, this is almost precisely the mechanism which has recently allowed the use of cheap USB VGA adapters as software defined transmitters. The interference generated by the device, normally nothing more than an annoyance, is expertly honed to become a useful transmission. Seems like the best tricks never get old. Bill took the original research published in Dr. Dobb’s and created a much more polished experience. Rather than having to toggle in data for each song you want to hear on the front panel, the user now has access to a menu which allows them to select from pre-defined pieces stored in the program. The upshot of all this is that anyone could sit down at the table and call up a song without any knowledge of the software or even the Altair itself necessarily. As an added bonus, Bill had set up an absolutely mint TRS-80 Model 102 as the terminal for the day’s demonstration. Which served as both an excellent example of the incredible battery life the Model 100/102 could achieve with nothing but AA batteries, and a chance for attendees to get hands on time with something different in a sea of green and orange CRT terminals. The dichotomy between the Altair with its brazen LEDs flickering away madly and the overtly 1980’s Model 102 definitely stood out on the show floor, and it seemed the chair in front of the Tandy was rarely empty. Based solely on the number of times one could hear it launch into the Star Wars theme during the course of the show, it’s safe to say this demonstration was a huge hit today. Just as it was all those years ago at the Homebrew Computer Club. ← Who Said Thermal Cameras Weren’t Accessible To The Masses? Wonder if it’s as much older electronics being noisier than say modern more efficient? Makes me think of devices before my parents were even born with spark gaps and arcs, then in modern times cheap most likely not even legal Asian devices with who knows what emissions. Plus the “who cares if you look official government or security contractor” modern FCC and whomever does radio directional finding and enforcement on static, noise, interference, jamming and Cuban, Moscow or Uzbekistan Embassy U.S. Diplomats and others compounded and concealed ops that are more than sound and cause bodily and serious mental facilities assault with intent to maim if not worse… especially with directional energy weapons and malicious intent criminal acts. Interesting article. God I love the TRS-80 Model 100 family. And I wish those 40×8 character displays were still available! They are! Cub 100 has them available (http://www.club100.org/ordform.html). Scroll down about two-thirds of the way to the bottom to find the LCDs. Club 100 also has full systems, as well as accessories and other parts, available as well. Neat! It sounds like they’re taken from dead units though, I’d feel bad trying to use one for my dumb projects and ‘taking’ it from someone trying to keep their model 100 running. I probably shouldn’t, but… humans are weird like that. … also there’s a large “NOTICE Club 100 Online Order Has been suspended for now!” at the top. I think I even saw one with an i2c controller on it. Combine with the appropriate 6×8 font and there you go. I recall from a couple decades ago an article (Electronics Now?) that made a Spectrum Analyzer using a varactor diode based TV tuner to do the frequency sweeping. Well, I’d say that using the local oscillator from a TV tuner as swept RF source is a far cry from modulating or demodulating a signal using digital signal processing. A long, long time ago, use to use an AM radio for sound with a SOL-20 to play Strek, the Star Trek game. Shooting the phasers and photon torpedoes would produce sounds that worked great with the game. Even warping to the next sector made what seemed like an appropriate sound. That’s about all AM is good for now. Hey, AM is great for emergency broadcasts. You can damn near build a reciever out of rocks and twigs, and need no batteries. Well, AM WOULD be good for emergency broadcasts … if anybody was listening to it. I mean, some people don’t even HAVE an AM radio. Note that the radio chip included in most smartphones doesn’t do AM. And even for those who do have AM radios, how often are they on? I mean, on AM? I’m sure I have an AM radio – the one in my truck has an AM/FM radio, but the antenna got broken off years ago, and FM still works but AM is completely dead. I have a shortwave radio – somewhere – that has an AM brodcast band. And I think I have a hand-cranked Sony radio that I’m sure has AM on it, BUT the hand crank charges a Ni-Cd battery, and I don’t know if that is still good. What were the specific mechanisms behind the transmission? I have a friend with an 8800 replica (based off of an atmega) that also generates AM signals, He said it had somthing to do with the LEDs resonating with the metal faceplate, as the AM interference wasn’t present in the later models with the plastic faceplate. The mechanism is current through a wire, aka an antenna. A synchronous CPU (i.e., virtually all microprocessors) uses more current at some portions of the clock cycle than others, drawing a pulsating current from the power traces at the 1 MHz clock frequency and a number of its harmonics. The amplitude of each pulse is related to which instruction the CPU is executing and other factors, so for example, by executing a sequence of instructions that vary the current repeatedly over a 1 millisecond period, the amplitude is modulated at 1 kHz. Luckily (unless you’re the next door neighbor just trying to listen to talk radio, 1 MHz happens to be in the middle of he AM broadcast band. In all likelihood, the fact that later models have less EMI is that MITS took some care in redesigning the system for less EMI. There were probably complaints to the FCC of interference from the earlier machines. A resonance between LEDs and the faceplate at or around 1 MHz is highly unlikely. Oh. Replica – so not quite the same thing, but still, a resonance between LEDs and the faceplate doesn’t make sense. This was done far earlier (1960s) with a few older computers. The Altair and similar machines were sold in large enough quantities that more people were able to hear it in action. BTW, this is why we now have FCC certification for digital devices! Interesting article, particularly as I’ve owned each of these computers in my past. A pair of Altair 8800b’s and a TRS Model 100. Diagnostics via radio? Now that’s some proper oldschool technique. Maybe there is a conspiracy to cover up LRAD’s, other ultrasonic invasive tech or commercial off the shelf stuff for using to diagnose like a counter Right to Repair by removing AM from the mainstream consumer market? Seems for narrower bandwidth detection the AM tool use comes to mind. jafinch78: I think you’re overthinking this. The FCC (and its corporate masters) cares about BANDWIDTH, and the whole AM band is only 1 Mhz wide. This is why they took away so much of the UHF TV bands – those are chock full of megahertz that can be sold to data communications providers. Nobody cares about the measly AM broadcast band. Which is kind of funny – the FCC (or whatever authority was in charge at the time) gave the “useless” HF bands over to amateur use. Of course, they took most of it back, but I guess they weren’t thinking very far forward. Or maybe they intended from the start to take most of it back. Could be – the not-yet-commercially-useful EHF (millimeter) bands are still freely available to amateurs, for now. But once the technology catches up, there are many GIGAHERTZ up there to exploit. BrightBlueJim: I might be overthinking, though was thinking Van Eck Phreaking like sort of more for testing for smaller frequency range signals like even harmonics, spurious emissions, static, noise, interference… though also diagnostics on boards more-so with a small portable device. Some of the newer AM radios were SDR even and can be hacked using an RTL-SDR to have a more detailed display using SDR software (same goes for the other designs too like Bill Cheek style discrimination tap though instead of to a scanner… to a SDR). I was more thinking there are still lower frequency electronics… though like for computers… they are up in the GHz now for sure. Guessing a broader bandwidth or at least frequency range RTL-SDR will even work compared to say a smaller grid dip oscillator. So, basically, they would care to not want people to have as high spectral resolution devices so to not resolve out details or lower frequency assault stuff like used in long range acoustic devices (LRAD’s)… whether plasma ion ultrasonic canon or COTS transducer ultrasonic canon. https://hackaday.com/2018/03/04/hackaday-links-march-4-2018/ (note the JAMA study “ultrasound was a potential culprit” following paragraph). Yes, it was like hearing a modem negotiate. You might not know what each sound meant, but you got used to repetitive sounds, and you’d notice wen the sound was different.